The theory of natural selection remains very important in the modern biology. Some phenotypes are more successful. They leave more offspring than the other phenotypes. It is a natural selection. The tendency for natural selection to occur and upset Hardy-Weinberg equilibrium is called selection pressure. Natural selection is simple in principle. But it is diverse in operation. Many populations have a range of phenotypes for certain traits. It is characterized by a bell shaped curve. It shows that phenotypic extremes are less common than the intermediate phenotypes. Natural selection may affect a range of phenotypes in three ways. n the early 1800s, a gray form made up about 99% of the peppered moth population. That form still predominates in non industrial northern England and scotland. In industrial areas of England, a black form replaced the gray form over period of about 50 years. In these areas, the gray form made up only about 5% f the population. But the 95% of the population was black. The gray phenotype as previously advantage. But it had become deleterious now. The investigators discovered the birds that prey on peppered moth. It searched the moth form the contrasting background.
) Prior to the Industrial Revolution: The trees had lichen-covered bark before industrial revolution. It has gray colour. The gray moths were bended with the gray bark of trees. Therefore, they cannot be spotted by the birds. But the black moth was easily visible in lighter back ground: Therefore, they ware easily spotted by birds.
) Early in the Industrial Revolution: The factories used soft coal. These factories released soot and other pollutants into the air. Soot covered tree trunks and killed the lichens. The bark became black. Now birds could easily pick out gray moths against the black background of the tree trunk. But the black form were camouflaged.The British _Parliament enacted air pollution standards in the 1950s. It has reduced soot in the atmosphere. Thus the gray form of the moth increased in frequency. The natural selection in which individuals of the most commons phenotypes are at disadvantage is called disruptive selection: Disruptive selection produces distinct sub populations. A population of snails has a range of shell colors between white and dark brown They live in a marine tide pool habitat with two background colors. Sand: The sand made up of broken shells of molluscs. So it is white. Rock: The habitat made up rock is brown. The shorebirds prey on snails. White sails are not actively selected in a white background: Thus shore birds do not prey on them. Similarly, brown snails on rocks are not spotted by birds. So birds also do not prey on them. But the birds prey on intermediate phenotypes on both sand and rock substrates. Thus disruptive selection produces two distinct sub populations, one white and one brown. A good example of stabilizing selection is the horseshoe crab (Limulus). It lives along the Atlantic coast of the United States. 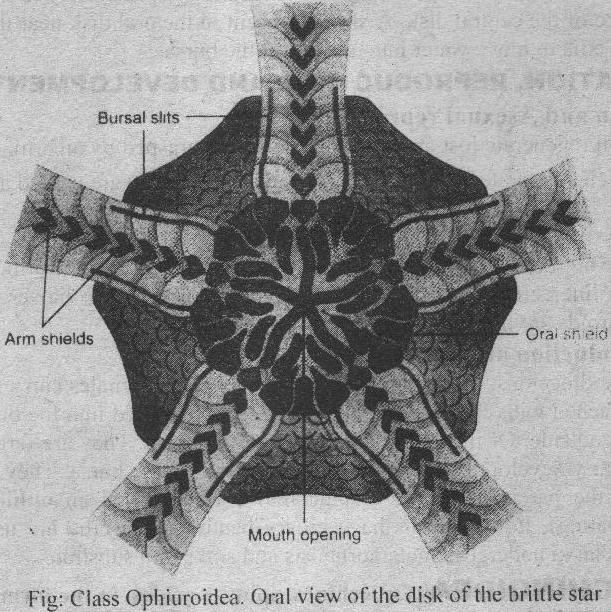 Its fossil is compared with the living forms. It indicates that little changes occur over 200 million years. Apparently,the combination of characteristic present in this group of animals is adaptive for the horseshoe crabs environment. Environments are relatively constant during long periods in a habitat. 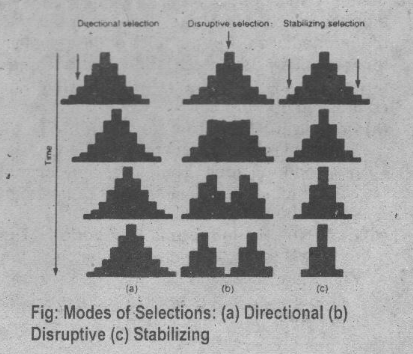 Therefore, stabilizing selection is acting on phenotypes. But neutral selection operates only at the molecular level. Certain gene can randomly establish in a population. However, sometimes, the environment shifts. Thus the directional or disruptive selection begins to operate. It changes the gene frequency. The debate about the relative importance of neutral selection and natural selection has started among evolutionists,. This debate is about the mechanics of evolution. These are the foundations of science. They lead to experiments. It will ultimately give a clearer understanding of evolution. The occurrence of two or more distinct forms in a population without a range of phenotypes between them is called polymorphism. Balanced polymorphism occurs when different phenotypes are maintained at relatively stable frequencies in the population. Sickle cell anemia is an example of a balanced polymorphism. A change in the structure of the hemoglobin molecule causes sickle cell anemia. This disease misshapes some of the red blood cells. It reduces their ability to carry oxygen. The quantities of normal and- sickle cells are roughly equal in heterozygous state. Sickle-cell heterozygote occurs in some African populations. It has a frequency as high as 0.4. This population maintains both sickle cell heterozygotes and homozygous genotypes at unchanging frequencies. The sickle cell gene is most common in regions of Africa. This region is heavily infected with the malarial parasite, Plasmodium .falciparum. heterozygotes are less sensitive to malarial infections. They .experience less severe symptoms of malaria than homozygotes without sickle cells. Thus normal homozygou individuals experience more severe malarial infections_ Therefore they are also at a disadvantage. But the individuals with homozygous for sickle cells suffer from severe anemia. Therefore, they are also at a disadvantage. The heterozygotes experience no symptoms of anemia. They arc more likely to survive than either homozygote. This system is also an example a heterozygote superiority. The condition in which heterozygote is more fi• than either homozygote is called heterozygote superiority. HeterozygotE maintains the alleles in the heterozygous condition. It maintains both alleles at z higher frequency than expected if natural selection acted only on the homozygous phenotypes. Therefore, heterozygote superiority leads to balanced polymorphism.